The glass is a very common material in a day to day living. Glass is a material which is widely used in various fields including construction, automobile, utensil and more etc. The float glass, commonly called as the plain glass is one of the products made out of glass. It is used mainly used by the automobile and the construction industries. The process of float glass manufacturing is called as the float process, here a continuous ribbon of glass is moved to a melting furnace, then cooled and hardened and finally cut according to a specific dimension required. Earlier times this work was done manually, where a person had to manually operate the separate sections of float glass manufacturing. This is a very hard and time-consuming process, also the quality of glass thus produced may not be very great. The heart of the matter is that the activities related to glass manufacturing, when done manually can result in a lot of irregularities. To avoid this and make all the process related to glass manufacturing clean and clear an ERP software can be made use of. Odoo/Open ERP software can handle the glass manufacturing industry very effectively with its varied features. 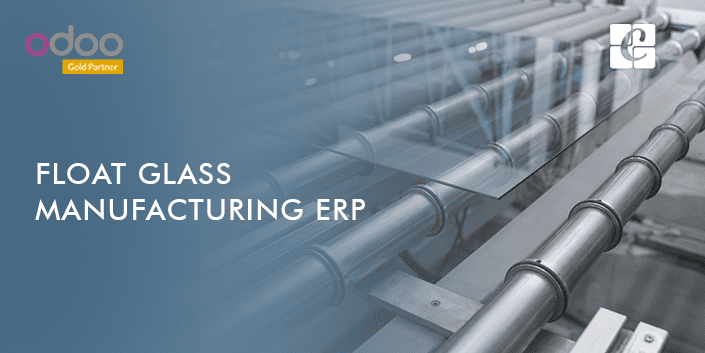 In this blog, we will see how an ERP software can help a float glass manufacturing industry with its variety of features. When an ERP in glass manufacturing industry is introduced, every business operations get streamlined and every task turn hassle free. Activities such as production, quality control management, material listing, waste handling etc. can be effectively carried out using ERP software for glass manufacturing. In the case of float glass manufacturing, it is carried out through some regular steps, the steps include batching the raw materials after checking their quality, production process (melting raw materials, moving raw materials to tin bath, cooling molten glass and cutting according to dimensions), quality checking after production, storage and shipping. Now let’s have a look at how the float glass manufacturing industry works and how the ERP software can be useful for the functioning of the industry. There are a lot of components required to produce glass. The main components required for this purpose are soda lime, silica, calcium oxide etc. To produce a good quality glass these materials should be of superior quality. Using the quality control feature in Odoo/open ERP, the quality criteria for the raw materials can be set and only when the raw materials satisfy these quality criteria they are selected for production. The next stage is the batching of the raw materials, each and every raw material cannot be put in the same area since their mixing before production is not allowed. Using the inventory management of Odoo ERP software, each raw material can be put in separate locations and can be sent for production at needed times. Also with the aid of inventory management in the ERP software, important details regarding receipts of raw materials, their internal transfers etc. can be accessed. When production is carried out with the assistance of ERP software for glass manufacturing it is called smart production. The glass manufacturing is carried out through several steps, these steps include fine mixing of the raw materials, transferring them to a heating furnace, heating them and making them to the molten state, passing the molten glass to cooling chamber and finally cutting the glass according to specific dimensions. Since there are a lot of steps happening in the production, they have to be managed exactly according to their hierarchical order and without any error. With the work center feature in Odoo/Open ERP software, the synchronization of work is assured. By creating work centers we can make sure all the process related to glass manufacturing are done accordingly. Now after the production process, the final glass sheets are manufactured. But still, they won’t be ready to be shipped to the customer side. Before that, the quality of the finished product must be analyzed. So once again the ERP software for glass manufacturing can be used, the desired quality which the finished product requires can be set in the quality control option of the ERP software. If the finished glass satisfies this criterion it can be sent for further processing, otherwise, it will be marked as scrap. The glass is a fragile material and is very likely to break. During the production of glass, this is a real challenge, scrap materials will happen for sure, their effective management is the task. For solving this problem the ERP software for glass manufacturing can be used, with the scrap management feature in the ERP software for glass manufacturing we can effectively transfer the scrap or waste products to a separate location. This reduces confusions and also makes sure that no defective products are sent out into the market. In an industry like glass manufacturing, it is very important to keep track of the products. The stocking details, selling details, product details etc., should always be ready so as to avoid any later confusions. To make this happen, the traceability feature in the ERP software for glass manufacturing can be made use of. The serial number/lot number tracking facility in the ERP software helps in effective tracking purpose. In the case of the glass manufacturing industry, they will be working on tight schedules. They should concentrate on certain points like finishing the production within the specific time-bound, produce quality products, shipping produced goods without any delay etc. The ERP software has got customer relationship management feature to carry out all the above-mentioned processes effectively without any error. So the ERP software can be used for maintaining the customer relationship. The shipping shall be carried out using the shipping module in the ERP software for glass manufacturing. The manufacturer has the privilege to choose the shipping company, delivery time, routes etc. ERP tracking can also be made use of, along with shipping. Coming to the case of invoicing information regarding the product, its cost, other detailed information etc., shall be invoiced to the customers without faults. With the ERP software for glass manufacturing, invoicing is made easy. The main advantage here is that the ERP software invoicing can integrate with the shipping module. This makes the invoicing during shipping a lot easier. Thus we can conclude that using an ERP software for float glass manufacturing industry is a smart choice for easy execution of business operations.